Twenty years ago David Brass had his head in the clouds, flying Harrier jets for the RAF. 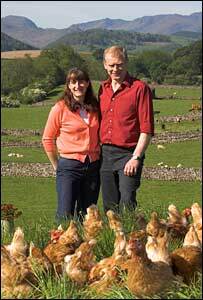 He is a farmer now, with his feet firmly planted on the ground - but his Cumbrian free range egg business is soaring ahead. 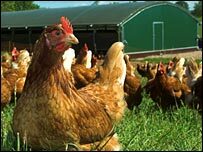 The Lakes Free Range Egg Company is now one of the largest egg packing companies in the UK, supplying major supermarkets and McDonalds. The company recently scooped a trophy at the National Farming Awards, being named as the best business in the food chain. And it has been so successful that a number of local farmers have invested in their own free range flocks to become suppliers - replacing or augmenting the declining incomes they were getting from their sheep and beef farms. David and his wife Helen made just such a decision in 1988 when they were struggling to make a decent living from Meg Bank, their family's traditional 120-acre beef and sheep farm in Stainton near Penrith. Mr Brass' flying career was cut short when he developed diabetes and he had returned to his parent's farm as a tenant in 1988. "We tweaked the farm a little bit, but we soon realised that the sums didn't add up and we couldn't support two families," he says. "My wife Helen then came up with the idea of getting a couple of hundred free range chickens and selling them from the back door to local shops and restaurants. "Pretty soon we realised we were making more from that than from the rest of the farm." Within five years, the flock of 200 hens had grown to 9,000 as consumers became more interested in animal welfare in the food chain and demand for free range eggs rocketed. Initially the farm supplied a local egg-packing station. But when it closed down in the mid-90s, the Lakes Free Range Egg Company stepped into the void. Mr Brass decided to build his own packing station and recruited a management team, employing the previous packing company's sales director. With the help of some rural development funding from the government and the European Union, the family was able to invest £1m in a modern packing unit with the capacity and quality standards needed to supply the major supermarkets. The company's first major contract was with supermarket chain Morrisons, but it has supplied most of the other major retailers and now sends 25% of its eggs - 500,000 a week - to McDonalds. Mr Brass employs about 50 people at his packing station and has recruited nearly 40 farms from Cumbria and North Yorkshire to supply his business. 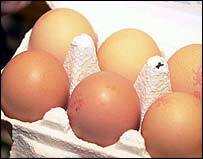 The foot and mouth outbreak of 2001 was a terrible time for rural communities in Cumbria and throughout the UK, but it helped persuade some farmers into making the change into egg production. "A lot of 50- or 60-year-old farmers got the compensation for killing their cattle and sheep and decided to call it a day," says Mr Brass. "Their kids took over and many of them had a little bit more ambition. They had young families and wanted nice holidays, and weren't satisfied scraping a living from livestock." The Lakes Free Range Egg Company now has a waiting list of potential suppliers. "We give the farmers 12-month contracts, which most of them are happy to work with, and I have never not renewed a contract. "We sometimes give them a longer deal if they have borrowed a lot of money to start up." Unlike many other farming sectors, the prospects for free range egg producers look good. The market is expanding, and producers can expect to earn a margin of about £4 per bird, excluding the cost of labour and rent. Rising fuel and feed costs have had an impact and fierce competition between the supermarkets has seen free range egg prices slashed. But Mr Brass remains optimistic. "Big customers like Tesco and Morrisons are demanding," he says. "But at least they don't go bust." Will chicken sales take a roasting?